When composing her second album, Lindsey Anne Powell of FIELDED wanted to make vocals the star, while getting back in touch with her “deepest love for Pop music”. 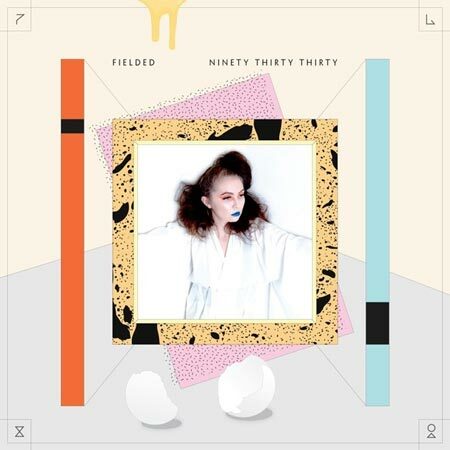 In Ninety Thirty Thirty, the soulful yet edgy singer-songwriter does both those things beautifully, blending the best elements of futuristic, experimental music and retro pop to create her own unique sound. Ninety Thirty Thirty is a very enjoyable album, and that’s largely due to Powell’s amazing vocal control. Many of the album’s exceptional tracks, including its break-out “Chapel of Lies,” feature powerful vocal modulations by Powell that slip and slide satisfyingly across her wide range while supporting full and edgy emotion. Either framed by precise harmonies or set against the backdrop of heavier instrumentals, Powell’s voice lends sass and personality as the album’s backbone. The combination of captivating vocals with dense layers of samples and instrumental parts creates an interesting wall of sound. In “Gabrielle,” for example, Powell’s vocals both float over and pierce through an industrial-sounding backdrop, while the lush harmonies in “Eternal Hour” are supremely gratifying against the song’s sparse and energetic instrumentation. The album’s multi-generational pop influences also propel Ninety Thirty Thirty‘s energy and originality. Beats, melodies, and vocal and instrumental flourishes reminiscent of ’60s, ’70s, ’80s, and ’90s popular music are scattered throughout the album. For example, “Arms of Heaven” features a head-bobbing ’80s-style beat, and the ethereal background vocals and guitar licks of “Eurynome” recall grooving pop ballads of the ’60s and ’70s. “Eternal Hour,” moreover, one of Ninety Thirty Thirty‘s best tracks, expertly combines the album’s vocal emphasis and use of retro elements through powerful ’90s-reminiscent female vocals that spike and flow over a tumbling ’80s-style beat. The incorporation of futuristic, experimental instrumentation amidst the album’s satisfying vocals and pop influences brings the album to a new level and highlights its darker undertones. Ninety Thirty Thirty relies heavily on electronic components, including synth parts, samples, and vocal loops, which infuse and re-ignite the album’s retro-pop feeling with contemporary elements. Moreover, several tracks feature unsettling and creepy spoken parts and other ‘inorganic’ samples, like footsteps and telephones ringing, as well as occasional modulated or off-color harmonies incorporated into background vocals. These experimental elements surface throughout Ninety Thirty Thirty, but are more apparent after the album’s transitional a cappella track, “Let it Out,” which showcases weighty and interestingly strange harmonies. Without overwhelming the album, Ninety Thirty Thirty‘s experimentation brings depth to Powell’s music, and underscores its thematic thread of bottled desire. The album concludes on a somewhat somber note, with the detached and dreamlike final track, “My Hand, Meant Only for You”. While listeners may find themselves craving the album’s earlier energy by the end, as a whole, Ninety Thirty Thirty displays Powell’s impressive musical range and indicates that she is definitely experimenting with and honing her sound. Its intricate combination of pop and experimentation allow Ninety Thirty Thirty to be accessible, empowering, and catchy at the same time that it is mysterious and elusive. And while we may hope for even more variety on FIELDED’s next album, in the meantime, we are free to dive into the shimmering world Powell creates on this expressive record.